By now, you should have a basic understanding of how WTF works so, following the example that I provided in the section titled “HaveMore Demonstration Micro-Farm” – build yourself something similar – but reflective of your own location and circumstances. I don’t have any organic waste. I don’t have any land. I don’t know how to farm. Fear not…help is at hand. You weren’t listening when I said “no cash outlay.” The only thing that stands between you and your own WT farm is the conscious decision to get started…and a waste stream or two. WTF starts with an organic waste stream and, whether you realise it or not, you already have several of them. Each type of waste represents a problem for you, and you have two choices. You either dispose of it – or you think of it as an opportunity – and find a productive use for it. If you’re like most other people, you eat and, in so doing, you have kitchen scraps, plate scrapings or peelings. What was once food for you, is food for other animals…like chickens, ducks or quail. If you don’t have enough for other animals, you can feed the kitchen wastes to worms. Your food wastes now provide you with more worms and the residue of what you fed them…worm castings. Castings are a superb soil amendment. Soaking the castings to make worm tea will yield the plant food equivalent of mother’s milk. If you find the thought of kitchen scraps/worms thing a bit overwhelming, you should know that you have another waste ‘stream’ right under your nose. Actually, it’s less than three feet below your nose. That’s right…we’re talking about urine…or, in cell phone-speak…ur urine. Human urine is very useful stuff…and you’re already carting some of it around with you. All it requires is a conscious choice on your part. If all of this talk of farming has you thinking ‘acres’ or ‘hectares’ it might be a good time to remind you that most of the world food comes from tiny farms that are measured in square feet/metres. Do you have a backyard? Do you have a patio or a flat roof top? So, you live in an apartment? Do your parents (or other relatives) have some space they could let you use? What about friends or workmates? The point is that, you need very little land to get started, and what you do need is often readily available for the asking. By the way, when I refer to land, I actually mean space. The space does not need to be arable. It just needs to be someplace upon which you can place things…far enough away from the noses of your neighbours that you won’t attract their invidious attention. Humans are arguably among the most helpless of all organism at the time of their birth. We’re all born knowing nothing – particularly how to farm. The good news is that, while it’s taken me a lifetime to learn what I know about integrated food production, you can learn what you need as you go. In the same way that you eat an elephant – one mouthful at a time – you can also learn what you need to farm…by breaking it down into manageable chunks. Fortunately, there are literally millions of places to acquire that knowledge at no cost – including YouTube videos, Facebook groups, discussion forums and websites like this one. You can also buy books and attend courses – or do them online. The important thing to understand, at this stage, is that you don’t need to acquire all of that knowledge up front. OK…it’s time to get started. Identify some organic waste streams and categorise them (Type 1 to Type 4). Add value to them (if necessary) and apply them to their highest use. Expand your operation to include new organisms. Collect their waste – and add value to it. Repeat steps #1 – # 4…until you outgrow your existing space. Find more space…and new waste sources…add more value…and more organisms. Rinse and repeat…until you have what you need or want. While it may seem simplistic, this brief prescription will see you grow from a few kitchen scraps to a waste transformation farm that produces fruit and vegetables, fish, chickens, pigs, cattle and everything in between. HaveMore Farm is my own waste transformation demonstration farm. It’s located on a 900 square metre (just under a quarter acre) residential block on Macleay Island in Queensland’s Southern Moreton Bay. As such, the climate is sub-tropical. I describe what we do as Microponics – it’s waste transformation farming at the backyard and small-to-medium enterprise level. The challenge when designing small integrated food production systems is to see every output as a resource…even waste body heat and expired carbon dioxide. When I first set out to describe a concept of small-scale integrated food production, over a decade ago, I called it integrated backyard food production (IBFP). Integrated Backyard Food Production became too much of a mouthful and so, in 2008, it became Microponics. The name suggests its own origins – the combination of micro-farming, micro-livestock and aquaponics. Some years later, I made the acquaintance of Dr Paul Olivier – a waste transformation expert. To my delight, his waste transformation model accommodated (and complimented) Microponics. He provided me with fresh insights into the integration of organic waste and I showed him how to integrate aquaponics/iAVs into his model. He persuaded me that using organic waste to make biogas was wasteful and polluting…and he designed the gasifiers that I now use as the alternative to biogas digesters. Suffice to say, I value his friendship and knowledge…and our collaboration is ongoing. The best way to get a sense of how waste transformation works on our micro-farm is to accompany me on my morning routine. The day begins with a quick trip around our various food production systems to confirm that fate has been kind to us overnight. Don’t laugh, we’ve encountered a carpet python (full of quail) in our quail pen and equipment failure has killed a tankful of freshwater fish. At the same time, I feed any fish that we may be growing, collect any eggs from our chickens and quail and gather ripe fruit and vegetables from my various wicking beds or aquaponics and hydroponics systems. I also harvest moringa, perennial peanut and duckweed. I check my BioPod and gather any black soldier fly larvae that have self-harvested overnight. BSF larvae are the favourite food of chickens and they disappear within seconds of them hitting the floor of the chicken pen. I fill our small gasifier with wood pellets and flash it up. A few minutes later, I have boiling water for a cup of tea which I drink as I sort through the fruit and vegetables that I’ve just harvested. I take the best of this bounty to the kitchen. I gather any kitchen scraps that may have accumulated in the preceding 24 hours and add some organic chicken feed and the remaining boiled water, to create a warm hot mash. This, and some duckweed and perennial peanut foliage, is also fed out. By this time, the gasifier has burned out and the wood pellets that were used as fuel have now become biochar. Our biochar production is an excellent example of where you take something of low value (the wood pellets), add value to it (the gasifier) and end up with high grade heat (to boil the water) and biochar for our gardens (and other uses). In this example, we’ve got the hot water at no cost and the biochar is worth much more than the cost of the wood pellets from which it originated. Where wastes, like rice hulls and nut shells, can be obtained for nothing, the biochar is free. Smaller quantities of mash, duckweed, and peanut are also fed to our quail. We’re gradually transitioning our birds from the expensive organic ration that we feed them to homegrown feed…so that the birds continue to lay at capacity while the change happens. Sudden shifts in the feeding regime will often be reflected in reduced egg production. Any manure that has accumulated in the chicken and quail pens is removed and fed to the BSF larvae. Counterintuitively, the manure quickly ceases to have any odour once the larvae get hold of it. For every kilogram of manure and food scraps that are fed to them, we get 200g of larvae in return. Even though we continue to use the purchased ration, the supplementary feeding has reduced the amount of the bought stuff that they consume – so our overall cost of feed has reduced. When the transition to a home-grown ration is complete, we’ll be feeding our birds for no outlay save our labour. Once our chickens have had breakfast, we let them out into a fenced space that we use as a soil pit. It provides them with shade, protection from predators and space to run around. It’s also where I throw all of the garden residues, grass clippings and bamboo trash. The chickens break this material down…spreading their manure…to create an excellent growing mix for use in our wicking beds and other soil-based gardens. All of this activity produces a series of waste transformation “cascades and loops” (as Paul Olivier calls them) that result in reduced inputs and increased outputs…more food for less money. The fish provide nutrients for plants (including duckweed) and the plants clean the water for the fish. Plant residues and fish processing wastes are fed to Black Soldier fly larvae. The larvae are fed to fish, chickens and quail. The chicken and quail meat and eggs go to the kitchen and the viscera (guts) are fed to the BSF larvae. The feathers are composted. The castings from the larvae (which retain up to 50% of their original protein level) and kitchen scraps are fed to worms. The worm castings are mixed with compost and used as a soil conditioner for trees, vegetables and fodder plants; while the worms are fed to fish, chickens and quail. Chickens fertilise the trees and eat weeds. They also eat spoiled fruit and the fruit fly larvae that it contains. Other chickens and quail eat the fodder plants and provide manure (and eventually feathers and other processing wastes) for worms, black soldier fly larvae and composting systems. Bamboo gives us poles for trellising and light construction. The leaves and twigs become fuel and mulch. Low value crop residues (like rice hulls, nut shells) produce high-grade heat for cooking and yield biochar. The biochar is infused with beneficial micro-organisms and mixed with our homemade garden soil. We’re even adding it to our livestock rations. The development of HaveMore Farm is a journey rather than a destination. Just when the end is in sight, new prospective integrations reveal themselves. If we weren’t constrained by zoning laws, we’d also keep meat rabbits, pigs, goats and even miniature cattle like Dexters. As it is, HaveMore WTF yields fish, quail/chicken/duck meat and eggs, worm castings/tea, duckweed, free livestock feed, vegetables, herbs, flowers and honey. We also get pollination, pest control, cultivation and weed removal as an added bonus. The integration of fish, plants and micro-livestock leverages the volume and quality of the clean fresh food that we grow – and it makes for a healthier and more resilient food production environment. Income that would otherwise be used to buy food becomes available for other sustainability projects. In short, HaveMore Farm allows us to have more for less. In the next (and final) article in this series, I’ll offer some insights into how Waste Transformation Farming might work from a business perspective. To understand how waste transformation farming works, we can do no better than to take a look at the work of Dr Paul Olivier. This disarmingly humble man – lives in Vietnam – and devotes his life to empowering the poor through waste transformation. He’s developed a transformation model for biodegradable (organic) solid wastes. Waste Transformation is a 4-step process: Wastes are identified…then they are categorised…and we add value to them…before putting them to their highest use. Waste is available from many sources – often just for the taking. There are many different types of biodegradable waste. The following list is not exhaustive, but it will provide some insight in the scope of organic waste opportunities waiting to be exploited. Waste heat and expired CO2. Of course, you don’t have to generate these wastes yourself. All you have to do is find them in your area…and then do the person who owns them a favour by taking care of their waste problem by taking them back to your place. Is rice grown (rice hulls)? What about nuts (like almonds, macadamias, walnuts)? Are there any shearing sheds in your area (the farmers will often allow the removal of sheep manure from under the sheds)…or is someone keeping horses (horse manure)? Are your neighbours mowing grass that they might like to deposit in a heap at your fenceline? Do tree loppers clear trees from around powerlines and then mulch the waste? Some morning tea or a light lunch may score you a truckload of mulched tree waste. Is there windfall wood on the roadsides that you can harvest? Do you live near food processing operations, restaurants/cafes, hotels or anywhere that has food wastes? Once you identify prospective waste sources, think about the logistics of collecting and storing the waste. What quantities of the waste are available? Is your requirement for this type of waste continuous, intermittent or regular? Do you have space to store the waste? Do you have to pay for it? How much? What is the cost of recovery and transportation? Even if you do not place a financial cost on your time, do you have to use a vehicle to recover the waste…or are they being delivered to you…at a cost? Can you ensure that the waste that you collect will not create a nuisance (like odours, flies, vermin) for your neighbours? Anxious neighbours are a clear and imminent threat for micro-farmers so you should not give them cause for concern. Those wastes are divided into those which are putrescent…and those which are non-putrescent. Further, split these categories into high grade or low grade. And then rank the wastes in order of nutrient content. Type 1 waste (e.g. fresh food and spent brewery grain) contains a lot of nutrients. Ideally this waste should be used for feed for higher animals. Lactic acid fermentation is the preferred way to transform Type 1 waste into feed. Another simple and effective way to ensure that food wastes are pathogen-free is to flash fry them. Type 2 waste is food that is unfit for consumption by animals. Arguably the best example is livestock manure. Generally, there’s no better nor quicker way to transform this type of waste than through the combined action of larvae and worms. Type 3 waste (e.g. leaves and coarse plant residues) is easily broken down by composting microbes into soil conditioners and amendments. Type 4 waste (e.g. bamboo prunings, macadamia shells, wood shavings, twigs, rice hulls, etc) is the stuff that won’t quickly break down in the compost heap and is often carted to the tip – or just discarded. Type 4 waste, however, is ideal for the production of syngas and bio-char. plant processing wastes and ferment them so that they become pig and poultry feed. …we are adding value to them. Organic waste sources abound and the opportunities to add value to them are limited only by our imagination. Another key WTF principle is that waste should always be put to its highest use. High-grade putrescent waste (Type 1) should not be composted or fed to larvae and worms, unless it has spoiled to the point where it can no longer be preserved as feed for higher animals. We only burn Type 4 wastes in a device that will give us biochar in addition to the high-grade. The effort involved making a top loading updraft gasifier (or the investment in buying one) is worthwhile in any situation where the waste is of uniform size…like nutshells, rice hulls and wood pellets. Low-grade putrescent (Type 2) waste that can be fed to larvae and worms should not be composted. Larvae, worms and worm castings are far more valuable than compost. That’s essentially how waste transformation farming works. It’s about identifying waste streams…adding value to it where necessary…and ensuring that we put all so-called ‘waste’ to its highest use…to achieve the greatest value from each waste type. By treating waste in this way, we produce valuable farming inputs (feed, biochar, compost/fertilizer/plant nutrients at little to no cost. The next article will look at the benefits of WTF. Waste Transformation Farming (WTF) is a productive, resilient and sustainable food production system. It’s about identifying and categorising organic waste streams – and adding value to them – before using them to produce clean, fresh organic food– while reducingthe need to purchase feedstuffs, fertilisers and soil amendments. The secret to WTF is integration. Integration, in a farming context, is where food production systems are linked to each other to enable the waste from one organism to become the feedstock for other organisms. Aquaponics/iAVs is an example of integration in which aquaculture and horticulture are combined. The fish are fed and produce waste that is converted to plant nutrients. The plants take up the nutrients and, in so doing, clean the water for the fish. Integrated systems are always more than the sum of their parts. They’re the combination of leveraging elements that are the functional equivalent of 2+2=5 (or more). In the aquaponics example, we get fish and vegetables for the same amount of fish feed that it would take to just grow the fish. We also get two crops for the same amount of water – a cost saving…and a huge environmental benefit. Of course, WTF is not limited to aquaponics. The thing that all of these organisms have in common with each other is that they generate some type of waste that eventually presents as a problem. WTF turns problems into opportunities. The next article will address how waste transformation farming works at a practical level. The United Nations has stated that, if we are to meet the food needs of the projected population, food production will have to double by 2050. Any one of these poses a serious challenge – but all of them together place the world’s ability to feed itself at serious risk. And it’s risk from which no-one is immune. For those of us who live privileged lifestyles in so-called developed countries, think about how quickly the food disappeared off the supermarket shelves the last time you experienced a power blackout – or a little riot – or some similar disruption to your otherwise cruisy lifestyle. These are the times when having money is really not much use at all. In anything other than a 48-hour ripple, inflation (official or unofficial) will quickly see your money lose its value leaving you to pay exhorbitant amounts just to acquire life’s staples. The first part of dealing with any problem is to know that it exists. So, now you know…and, quite simply, if you’re not taking active steps to mitigate against the risks to the food chain, then you’re part of the problem. So, where are you on the problem/solution spectrum? Do you have any ideas for how to turn this mess around? by garyd | Jan 2, 2018 | UAP Manual - 4th Ed. This is “Part 1 – Introduction to the RAS build” of Chapter 8 of the Urban Aquaponics Manual. In Part 1, I’ll walk you through the water flowpath for our proposed build…and then we’ll look at the tools that I’m going to use. In Parts 2 to 6, I’ll show you how to build each of the major system components. In Parts 5 and 6, I present you with a choice…between a moving bed bio-reactor (very effective but at a cost) or a trickling biofilter (still quite good but much cheaper). In Part 7 – we hook our various components together. The pump starts and moves water from the sump to the IBC fish tank. The water enters the tank tangentially and imparts a circular motion in the water in the tank. Solid wastes are pushed outwards to the tank walls and fall to the bottom. When they reach the bottom, they begin to move toward the centre point at the bottom. 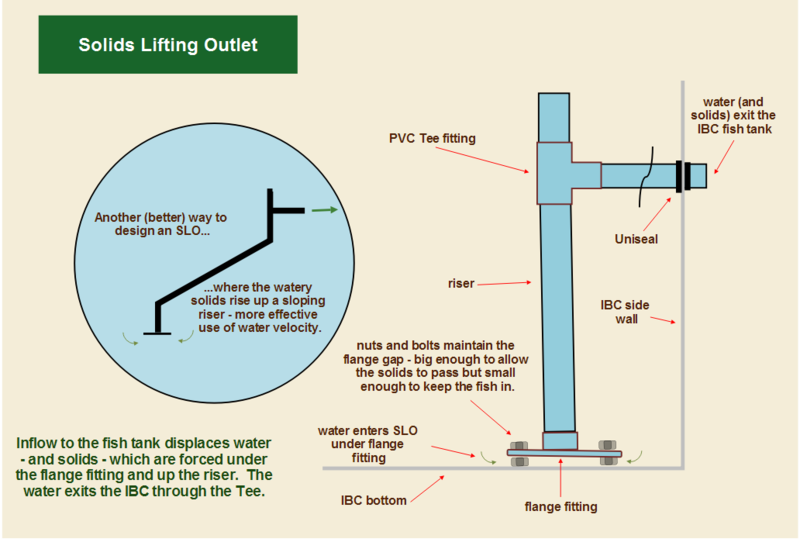 The weight of the incoming water displaces water already in the fish tank and forces it up the suction end of the solids lifting outlet…drawing any solids that are within reach of the suction. The water passes through the fish tank wall and into the radial flow separator (RFS). The incoming water in the RFS is directed upwards into the water deflector which causes it to change direction – downwards. The downward movement of the water encourages the heavier particles (sedimentary solids) to gravitate to the bottom of the RFS. The lighter water (without the sedimentary solids) rises up to the weir where it overflows and drains into the packed media filter (PMF). As it enters the PMF, the water is directed to the bottom of the filter. As it reaches the bottom, the velocity of the water is reduced and it moves upwards. It rises slowly up through the static media in the PMF exposing suspended solids in the water to the sticky biofilms on the media. The ‘clean’ water overflows the weir and enters the moving bed bio-reactor (MBBR). The water is directed to the bottom of the MMBR slowly rising up and exposing the dissolved solids to the nitrifying bacteria that live on the gently tumbling bio-media. Once it reaches the surface, the water overflows the weir and drains into the sump tank…and so on – ad finitum. I should point out, at this stage, that there’s another layout option…one where the pump is located in the fish tank. The water passes through the filters and then drains back into the fish tank. This layout requires that the filters be positioned above the fish tank. That means that we dig a hole in the ground large enough to accommodate the fish tank…or we put the filters on a platform high enough for them to be able to drain directly back into the fish tank. The upside to this arrangement is that we no longer need a solids lifting outlet – or a sump tank – so the build is easier. One downside is that integrating growing systems will be a bit more challenging. And then there’s the digging part. My view is that life is too short to spend any of it digging holes that aren’t absolutely necessary. Cut plastic – specifically the plastic bladders of IBC’s. Cut steel – specificically the galvanised steel frame of IBC’s. Cut PVC pipe – in the range of 20mm to 90mm (3/4″ – 4″). Drill holes – specifically those required for the installation of bulkhead fittings and Uniseals. Wrenches – or (more specfically) any device that will enable you to grip bulkhead fittings during installation. With the odd exception, I’ll be leaving all of the pipe and fittings unglued. This is a basic recirculating aquaculture system and there will be things that we can do to enhance it…and, should you decide to embrace those enhancements at some later stage, doing so will all be much easier if we haven’t glued every fitting or piece of pipe. Having said that, unglued pipework is a risky proposition, so we need to demonstrate some commonsense around how we set things up. I’ll be using ball valves to enable us to isolate each major component. This allows us to work on a single component without having to drain the entire system. Each of the filters will be fitted with a dump valve…to enable us to clean and drain it. That said, let’s build a fish tank. by garyd | Dec 17, 2017 | UAP Manual - 4th Ed. This is Part 1 of Chapter 8 of the Urban Aquaponics Manual. Notwithstanding the uncomplimentary things that I had to say about IBC’s in earlier chapters, I do acknowledge that, for many people, they are the most cost-effective means by which to acquire a fish tank. For that reason, we’re going to use one for this build. My biggest issue with them is that their shape and structure can be problematic when it comes to concentrating and removing solid wastes. Most of them are not actually square; they’re slightly rectangular. The bottom of an IBC is not flat; it has structural moulding that discriminates against herding all of the solids into its centre. Suffice to say, if we can make this work, you’ll be able to take what you learn and make any round or square tank work even better. Our first task is to remove the steel retaining bars to give us free access to the plastic bladder. Then, we mark up the top in readiness for cutting. Removal of the top allows access to all internal surfaces of the IBC – to give it a thorough cleaning – and for ongoing management. This particular unit contained glycerine in its former life – non-toxic, water-soluble and easy to remove. An electric jigsaw is my weapon of choice when it comes to cutting IBCs and other plastic containers. The dump valve enables the IBC to be emptied and the space immediately behind the valve is a trap for solid wastes. To prevent your toddler (or your sister’s toddler) from operating the valve, we’re going to zip tie it in the shut position. And then we’ll plug up that space behind the valve to prevent solid wastes from accumulating there. I’d like to be able to drain this tank directly through its bottom but, the pallet arrangement doesn’t easily lend itself to that, so I’ll install a solids lifting outlet (SLO). This is a fancy name for a simple device that uses the weight of incoming water to displace water already in the tank…forcing it up a pipe and out of the tank. Clear as mud…right? Well, hopefully, this simple diagram will clarify things for you. We’ll be setting this IBC up so that the solid wastes are directed to the centre of its bottom…so it’s logical that we’ll place the suction end of the SLO over that point. Before we get too concerned about the SLO, however, it’s time to modify our IBC for its new role as a fish tank. Step 1 – Remove the retaining bars at the top of the tank. Step 2 – Mark out a square section to be removed to provide our tank opening. Step 3 – Cut and remove the plastic top to create the opening. Step 4 – Mark out the exit point for the SLO – and drill a hole of the appropriate size. Building the SLO is a simple matter of assembling some PVC fittings and a couple of short sections of pipe.